This impromptu session was spurred on by getting 'that feeling', but it started off badly before I got two hundred yards from home. I'd rounded the corner out of the estate when I heard something scrape along the car's roof. Looking in the rear-view mirror I saw my bait tub smashed open and frozen boilies bouncing down the road. D'oh! That was number one. The second attempt at the journey went swimmingly, I made good time until I was about five miles from the venue, and a mile or so from the usual turning I take from the dual carriageway, when traffic came to a standstill. I sneaked off at the junction before mine to find that where that road came to the usual exit roundabout traffic was being diverted off the dual carriageway and onto the A road to my chosen venue. The flow was slightly faster here until I came to the traffic lights leading through the village to the river where it was again snarled up. So I headed straight on, planning to double back over the next bridge and get to the stretch I intended fishing from that direction. All went well until I came within a hundred yards or so of the car park when the traffic was again crawling along. The journey had taken me almost an hour longer than it looked like it would when I was 'ten minutes' from the river. That was number two. There's a definite change in the weather now, and even with the sun out the cool breeze demanded a fleece be worn once I was in my chosen swim. With the river really clear and low I wasn't surprised to have the stretch to myself. I settled down for a sandwich and a cup of tea while re-tackling and making up some small bags of pellets. I also threw a handful of pellets in the swim before wandering off for a look around. The plan was to fish three or four spots once it went dark. But in the meantime I cast two rods out, just in case. 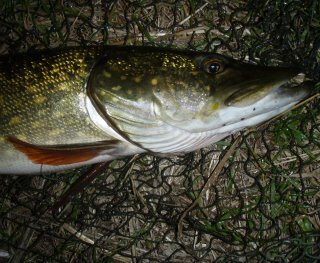 Once night fell I moved to the furthest swim, baited with a few pellets, put a walnut sized bag of pellets on the hook and cast out. After an hour I moved to the swim I'd already baited, and repeated the process. To my surprise the rod wrapped round after twenty minutes, but after a few seconds the hook came free. And this was using mono - just one of those things. That was number three. I rested the swim and went to throw some bait in the next one. On my return I put a second rod out to the far bank, this one fishing two 6mm plastic pellets. Having hooked one fish I thought I'd give the swim a bit longer, but two hours later nothing had happened apart from a couple of sharp taps. I picked up the far bank rod, turned the reel handle and felt a fish on. It wasn't pulling like a barbel and I suspected a chub, but it felt odd. To say I was surprised to see a skinny pike of about five pounds break surface is an understatement! The final swim had produced nothing after an hour and a half, so I called it a night. But the session had proved what I already knew, even when the river is low and clear and the majority of anglers are leaving it alone fish can be caught - if the bloody hook stays in!